Americans who identify as lesbian, gay, bisexual, or transgender are more likely than non-LGBT Americans to report that they lack health insurance, according to Gallup. 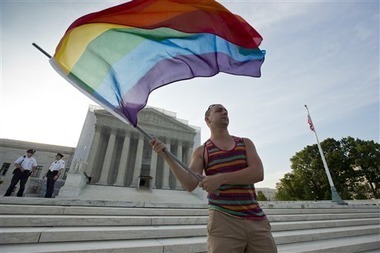 The LGBT community continues to report that its members face greater obstacles in daily life than do non-LGBT adults. A Gallup survey that focused on health insurance once again underscored this social disparity. Gallup asked nearly 45,000 U.S. adults to describe their health coverage status, including about 1,800 who identified as LGBT. The good news: More LGBT adults reported having health insurance in the second quarter of 2014 (82 percent) than in the third quarter of 2013 (76 percent). But among non-LGBT respondents, 87 percent said they had coverage, compared to 83 percent in Q313. Gallup cited both the ability to pay for health coverage and access to a primary care physician as possible reasons for the discrepancy. Gallup also suggested that more attention needs to be paid to the LGBT by pollsters and others who conduct demographic surveys.